A vital aspect of any lone worker monitoring procedure is the actual ‘check in’. By legislation in the UK and in many Canadian provinces, lone workers must be monitored for safety reasons. Here is some information about how you, as an employer, can devise and establish a lone worker check in procedure. What ways can my lone worker check in? The most commonly used lone worker check in method is by phone. Lone workers call in using a home, workplace or cell phone at predetermined intervals. Many lone worker solutions also offer check in via sms. 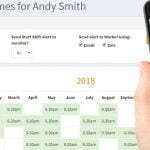 More recently, lone worker apps have become popular, where check-ins can be made using an Android smartphone or iPhone. Why use a Smartphone App to check in? It’s critical to ensure that your lone workers have access to a reliable check in method. A smartphone app for Android or iPhone can manage lone workers’ check in times. They can be alerted when their check in is due using notifications. Additionally their location could be tracked in case of emergency and they can create high risk check in, if they are entering a dangerous area. How can I ensure lone workers check in? To make sure lone workers check in, you need a work alone app that is easy to use, reliable and efficient. Our lone worker app runs quietly in the background and will alert your employees when it is time to check in by displaying a notification. They can then open the app and check in with a few clicks. What if our lone workers miss a check in? If your lone workers miss a check in on the work alone app, you need someone to respond. This can either be a member of your team, called a monitor or a live monitoring call center. Your monitors can be alerted using email, sms or by a phone call and can then respond to the situation. Your work alone app can even monitor your own employees within business hours and switch to live monitoring after-hours. What steps are taken if a check in is missed? Once a check in is missed, an alert should be sent from the lone worker app. The monitor or live monitoring call center will receive the alert and start to work through the escalation procedure. An escalation procedure is an action plan that outlines exactly what to do when a lone worker calls for help, or when they’re overdue, unaccounted for, and non-contactable. Want to try an easy lone worker app and system today? Head over to our Ok Alone App page and get going in less than 3 minutes. You can start your first shift, send a help request and logout – all without reading an owners manual or needing a “personalized demo” with a salesperson. What is the meaning of ‘Lone Worker’? What is a Monitor in lone working?